Imagine this: a swell of bodies, each cascade in a litany of neon colors. Each of them stand before a large black stage, eager and restless, glancing hopefully up at the platform, until it happens… the band appears, clad in black leather, the house lights gleaming off of Halford’s mirrored sunglasses like the sun on a stretch of abandoned highway. The band has come to rock—and everybody in the crowd knows it. But it wasn’t always this way. Back in the fall of 2013, Dave Avaness, and Kris Kallas were simply two musicians, who had, by chance, come together to form a casual cover band. Chris Keating joined them soon after, and things were finally picking up momentum. They had passion, they had drive, but by the time they had landed their first gig in the fall of 2014, they knew something was still missing. The group got to talking. Each of them had grown up with a deep appreciation and love for music that spanned all manner of genres. But the more they talked, the more clear it became that one band in particular had impacted each of them on a deeper, more profound, level. One band had stood out to each of them at one point in their life or another. That band was Judas Priest. In early 2015 the trio set out to find additional members to complete the band, but the task proved quite challenging. They played their first show in the spring of that year, but something still didn’t feel complete. The search continued, and the band auditioned many drummers and guitarists who came and went—some to other bands, some out of state—but they never gave up. Not only did they need to find just the right sound, they were in search of the right chemistry, both on and off the stage. The following year the planets aligned, and the final two members, Scott Brooks in early 2016, and Rocco Cretacci in late 2016, climbed aboard the metal train, completing the KK and Holland/Binks to their Halford, Tipton, and Hill. Priest Unleashed was ready to rock. Since that time their song lineups have evolved, and their outfits have gotten even more dauntless, but their passion and drive remains the same. Priest Unleashed was never formed with the intention of creating something new, but rather with the intent of capturing a sound and era too many of us have forgotten. The music of Judas Priest was created in a time before twerks and auto tune…a time when music came straight from the soul. Today, Priest Unleashed holds true to that sound, and mentality. Their fans can always be found near the stage, ready to immerse themselves in a glittering world of spikes and possibilities. 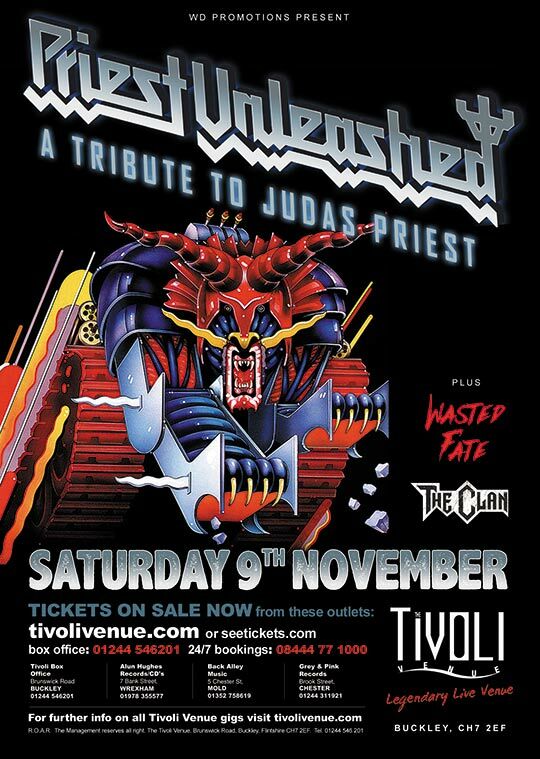 Priest Unleashed is always loyal to the music that created all those metal memories. What Priest Unleashed fans love is their commitment to the recreation of that classic look and sound, their attention to a song’s most minute detail, and the metal attitude that defined the music of a generation. The same songs that sent you reeling down nostalgia lane are suddenly live, blasting from the speakers on stage, as intricate and as unapologetic as ever. Fans can linger among like-minded individuals, and rest assured that these Metal Gods will be Delivering The Goods in an authentic, no holds barred true Judas Priest experience, guaranteed to make you long for a leather-clad world full of head bangers, driving beats, crunching guitar riffs, and vocals that will split your very soul… Your Metal Soul. Support comes from two local rock faves The Clan and Wasted Fate.